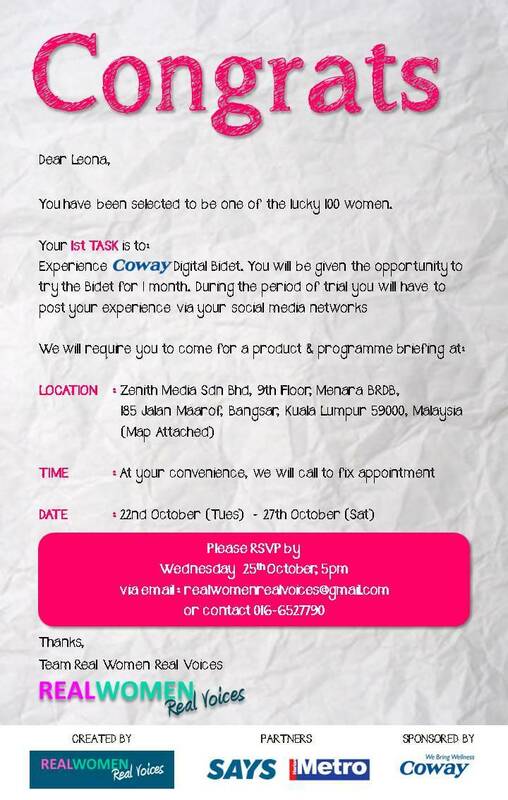 Recently, I chanced upon Real Women Real Voices, a new community on Facebook that is giving women all over Malaysia the opportunity to voice their opinions on certain products, and the first company that came on board is Coway with the Toilet Bidets. I registered on their facebook page and was selected as one of 100 women to try out the Bidet for 4 weeks in my home. Quite excited as I’ve always wanted a Bidet in my toilet, like in Kdramas. Previously I did not know that Coway had such products, I thought they only sell Water Filters. My 1st task was to attend a briefing at Zenith Media, the group that started Real Women Real Voices. It was a short meeting with one of their super friendly staffs, in their very beautiful office. My task in exchange for ‘free’ use of the bidet is so simple. Just voice my utmost honest opinions on their Facebook Page. I don’t even have to blog about it, but being a blogger, this comes most natural to me, so hence, this post. After the whole experience, if I had fallen in love with the bidet, I can buy it over for half price! The current ongoing promotion for Coway is only 20% off, so it is quite a great offer. Due to this, I chose the Battery powered Bidet rather than the Digital one as I would be able to afford it at 50% off later. I also learned so much about the health aspect of using a bidet, not to mention it will be more eco-friendly as I will use less toilet paper. Never thought of it that way. Furthermore, the digital bidet that is electric powered even has a warmer and dryer. I can’t wait to try it out! More posts to come on my experience with this cool product.